On October 30, 2018, Infopulse attended and spoke at Digital Evolution Forum 2018, a digital transformation conference hosted by Microsoft in Kyiv, Ukraine. Digital Evolution Forum 2018 is the second annual event for C-level managers and SMB owners. The one-day conference aims to accelerate the digital transformation of successful and growing businesses in Ukraine through the integration of innovative technologies and transition to more effective business models. With 6 parallel tracks, 30 expert speakers, and 1,000 participants, this year’s event offered in-depth insights, vast opportunities for networking with industry experts and gaining a strategic competitive advantage on the ever-changing market. A Microsoft Gold Partner and Tier 1 CSP for EU Market, Infopulse presented our recent digital transformation projects for Darnitsa Pharmaceutical Firm, one of the largest pharmaceutical producers of ready-made drugs in Ukraine. Office 365 is a modern SaaS cloud service by Microsoft, allowing to get maximum value from working with email, documents and communication tools. High availability and mobility of Microsoft cloud platform leverage day-to-day efficiency and profitability of businesses. Andrii Romanenko, Darnitsa CIO, spoke about how a recent transformation project implemented by Infopulse for Darntisa Pharmaceutical Firm drives innovation and influences internal corporate culture. Mr. Romanenko shed light on specifics of Office 365 adoption, focusing on how migration to a modern cloud platform could be an important step towards digital evolution. Attendees learned about the importance of Microsoft business productivity platform for a deeper involvement of all employees and productivity of remote-working specialists, as well as a valuable contribution of certified technical support to the success of the company. While describing an instrumental role of Office 365 for business continuity and building highly effective processes, Mr. Romanenko specified that Office 365 had turned out to be invaluable for better labor force management, decision making, personal productivity, and fresh ideas creation. A keynote was delivered by Pavlo Diachenko, Sales Manager of Cloud Solutions, Infopulse. SAP, a powerful ERP and Business Analytics platform, can help any industry tackle the most complex and challenging tasks. However, SAP systems require a complex approach to building a sustainable IT infrastructure and a proper, highly qualified technical support. A long-term SAP partner and a one-stop shop for all SAP services and needs, Infopulse helps businesses overcome these and other challenges by migrating SAP systems to Azure cloud. Designed in a close collaboration with Microsoft and SAP, this service vastly improves performance, maintainability, and reliability of SAP products with up to 75% lower TCO and up to 60% lower hardware expenses. On the example of the project conducted for Darnitsa Pharmaceutical Firm, Infopulse demonstrated how migrating SAP servers to Azure would improve latency, productivity and overall performance of SAP systems. Ivan Musiienko, Infopulse Head of Microsoft & Cloud Practice at Infopulse, and Andrii Romanenko, Darnitsa CIO, shared insights about the project, migration aspects, and spoke about the benefits of this solution. Pavlo Diachenko, Infopulse Sales Manager of Cloud Solutions, opened the presentation with a special keynote. 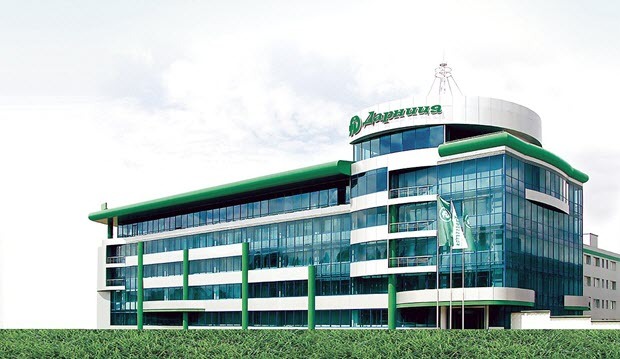 PrJSC “Pharmaceutical Firm “Darnitsa” is Ukraine’s largest producer of medicinal products, having long-standing pharmaceutical traditions. With 88 years of history, Darnitsa takes the leading position in the domestic pharmaceutical market by volume more than 20 years that proves to be true by year-to-year indicators of industrial and market activity of the enterprise, as well as authoritative branch ratings. Darnitsa shows significant progress within the process of digital transformation, succeeding in implementation of market leading technologies.